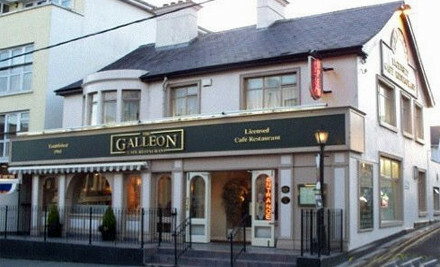 The Galleon Restaurant in Salthill, Galway has been serving satisfied customers for the past 45 years making it an absolute institution in Salthill. There really is something for everyone on their extensive menu and they will cater for any dietary requirements. The restaurant is very family friendly with young guests provided with pictures and crayons to play with whilst the adults eat and drink. The staff here are super friendly and if you have a “cupla focal” as Gaeilge, they will happily return the chat! They also have a separate area to the back of the restaurant area which can be used as a function area, perfect for celebrating confirmation, communions etc. And another real bonus – free wifi – well done guys! As mentioned, the menu is extensive covering all meals from breakfast through to dinner or if you just want to pop in for a coffee and a scone, then that’s there too. The menu is well priced with a list of daily specials available from 12pm to 5pm. Main courses off this menu cost E10 and there is a good selection including a roast of the day, a fish dish of the day, Traditional Irish Lamb Stew, Bacon & Cabbage, Spaghetti Bolognese and a number of others. You can have a main course and a starter for E14.50 and starters include soup, garlic bread and breaded mushrooms. There are also evening specials available and a full a la carte menu with many fish dishes, chicken dishes, red meat dishes, salads and sandwiches not to mention desserts. There is also a separate Children’s menu. Wine, spirits, beers and liquers are also available. This is a great local restaurant which continues to please its customers with its varied, well priced menu and its true Galway hospitality.